The longer I left it, the more difficult it became. I’ve not been feeling well lately. When I say lately, I mean months and months, maybe even a year or two…I’m not entirely sure. What I do know is that I’ve been carrying this unwellness around in my head, keeping it from my family. Wanting to talk, and never knowing what to say. I’ve played conversations out in my head over and over again. They nearly always seem to end badly and I take that as a sign that silence is probably the better option. I choose to isolate and withdraw, most notably from those closest to me. Over time, I slowly become aware of three things. A lack of self care, a lack of motivation, and a surfeit of anger, most of which I internalise. It’s fair to say these things are not constant, and there are better things in the mix too, however this unwelcome trio are occupying too much space. What might it take for things to shift? 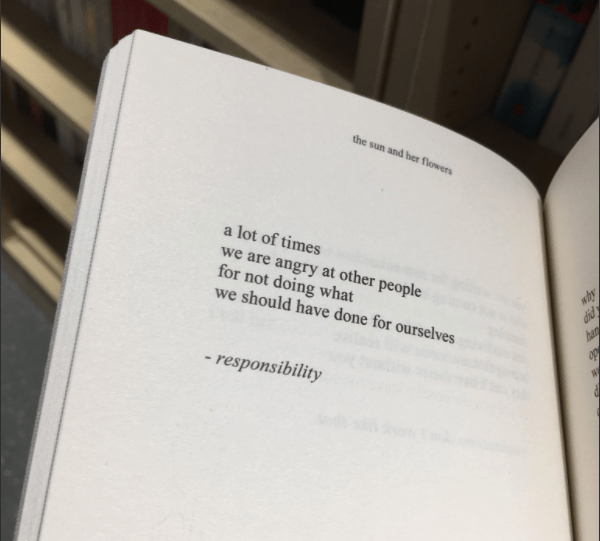 Last week, I stumbled on this photographic tweet from Holly Davis, the poem is by Rupi Kaur. This idea has always resonated with me and my work. One of the biggest causes of friction and failure when it comes to change and organisational development, is our reluctance to take responsibility. It’s easier to apportion blame than take responsibility, yet apportioning blame often anchors you in the past, while taking responsibility can create space to rebuild and move on. I realise I am responsible for internalising how I feel, and while I do not and should not feel a need to pass on everything that’s flying around inside my head, acknowledging and taking responsibility to speak is vital. Sunday morning after breakfast, it all comes out. What ‘it’ is need not concern you, but what’s important is that in speaking, listening can occur, shared space can be found, and empathy and understanding is generated. Thank you Carole, I’ll not leave it so long next time. Next Next post: Poppies 2017 : Work In Progress.